1. History excerpt from McConvell, P. "Gurindji," in Dixon, R. M. W. and Blake, B. J. (eds.,). 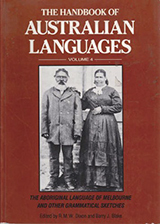 The Handbook of Australian Languages: Volume 4: The Aboriginal Language of Melbourne and Other Grammatical Sketches. Oxford, Oxford University Press, 1992. "The Gurindji people are famous in Australia because they went on strike from Wave Hill Cattle Station in 1966, challenging the regime of dire poverty and exploitation which then existed on northern cattle stations where they worked as stockman, station hands and domestics. In the end, the strike turned out to be not just about wages and conditions but about land rights. After a change of government, the strike led to the return of some of the Gurindji traditional lands in 1975. This was a major factor which led to the enactment of Land Rights legislation for the Northern Territory in 1974 and 1976." Wattie Creek or Dagaragu was chosen as the destination of the walk-off. 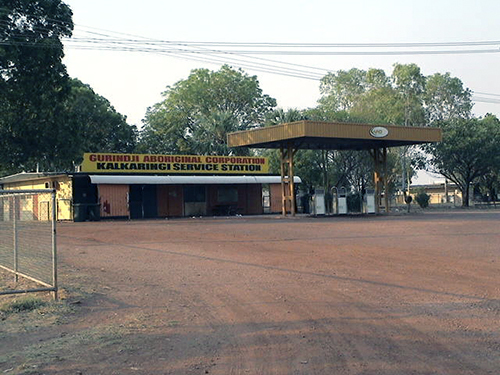 Later, Kalkaringi was set up about 8 kms away on the Victoria River as a town to service the nearby stations. 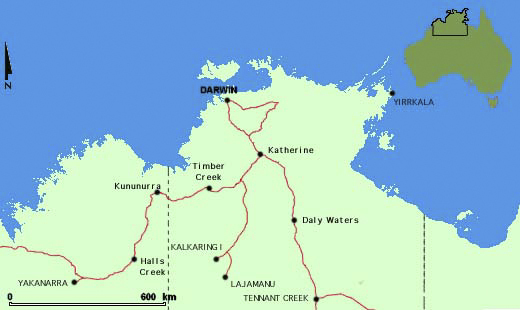 Many Gurindji moved to Kalkaringi and now both Kalkaringi and Dagaragu are home to the Gurindji. Kalkaringi contains most of the facilities such as the Community Office, school, abattoir, garage and shop. The CDEP office, a bakery and Batchelor Institute facilities can be found at Dagaragu. The walk-off is celebrated every year on 22 August as Freedom Day. The walk-off and subsequent return of traditional lands has been immortalised in music by the local band The Lazy Late Boys and by Paul Kelly's 'From Big Things, Little Things Grow' . Although the older people speak Gurindji, the main language spoken in these communities is Gurindji Kriol, which is being transmitted to the younger generations. Gurindji Kriol is used in a majority of contexts including family settings, the office and shop. Children are schooled at Kalkaringi in English. The school used to run a Gurindji language program (with the Gurindji speakers and a linguist from the Katherine Language Centre), however this has been discontinued. This part of the ACLA project was run at Dagaragu with eight families, who were very generous with their time and patience. Felicity Meakins visited the community every six months, and, together with Samantha Smiler Nangala, they recorded these families talking to their children. Felicity also interviewed people from different generations about their attitudes to Gurindji Kriol, and collected language texts to document Gurindji Kriol. The video and audio were transcribed and checked with Samantha Smiler on these field trips. The Dagaragu part of the project was supported by Diwurruwurru-jaru Aboriginal Corporation (Katherine Regional Aboriginal Language Centre) by the use of their vehicles, production facilities and office space. Dagaragu Council and Batchelor Institute allowed Felicity and Samantha to use the Batchelor caravan at Dagaragu. This project could not have been conducted without the support of these organisations. Tennant Creek is the urban centre of Warumungu country. During the 1970's, the era of Federal government Self-Determination policy, Aboriginal people began to move or return to Tennant Creek from cattle stations and Warrabri Aboriginal settlement. In the face of opposition at their attempts to settle in the town, from authorities and European towns people, Aboriginal people began to establish organisations to gain representation, infrastructure and services for their community. Over the next decade a housing authority Warramunga Pabulu Housing Association (later Julali-kari Council), a health service Anyininginyi Congress and an office of the Central Land Council was opened. Today, Aboriginal people of the region have rights to country surrounding the town, claimed and recognised under the Aboriginal Land Rights (Northern Territory) Act 1976. The original Land Claim was lodged in 1978, for a decade the Warumungu fought for the return of their traditional lands. The ruling was made in 1988 and the hand back of the claim areas began soon after. The individual histories of Aboriginal people in this region are rich and varied, and associated with places across Warumungu country. Some recollect living in camps at the old Telegraph Station. It had been established in 1872 as a repeater station for the Overland Telegraph line, the first European settlement in the region. It was built on the northern bank of the Tennant Creek, at Jurnkurakurr, a site of significance to the Warumungu. At the Telegraph Station to the south at Barrow Creek, conflict between the local Kaytetye and Europeans broke out in the 1870's and lead to punitive expeditions, in which many Kaytetye, Warumungu, Anmatjerre, and Alyawarre and Warlpiri were killed. Conflict, largely over cattle, and resultant frontier violence occurred in many places in Central Australia in the first 50 years of settlement, causing the displacement of Aboriginal people. In the early 1900's Alyawarre and Wakaya fled violence at Hatcher's Creek and moved to Alexandria Station and other stations on the Barkly Tablelands. Many moved later to Lake Nash. Eastern Warlpiri people fled after the Coniston massacre in 1928, many onto Warumungu country. By the 1890's it is estimated that 100 people were living at camps around the Tennant Creek Telegraph Station, some receiving rations, some worked for the station. Many came to the site during the 1891-93 droughts, to the perennial waterholes along the creek, which Warumungu people traditionally used in drought years. An area of dry country to the east of the Telegraph Station was gazetted as a Warumungu Reserve in 1892, to be revoked in 1934 to allow mining in the area. In the 1930's gold was discovered, starting a gold rush, which brought hopefuls from across the country. Aboriginal people worked on the mines, many of which were located on what had been the Warumungu Reserve. Tennant Creek town was established in 1934, at a site 7 miles to the south of the Telegraph Station. It was off limits to Aboriginal people until the 1960's. Warumungu and Alyawarre people also worked at mines in the Davenport Murchinson Ranges, after wolfram discovered at Hatcher's Creek in 1913. Many Aboriginal people spent substantial periods of their lives there and on neighbouring Kurandi Station, where, in 1977 Aboriginal workers went on strike and staged a walk off. The life histories of most people include their experiences living on cattle stations, which eventually surrounded the original site of European settlement. Vast tracts of Warumungu country had been granted as pastoral leases and were stocked from the 1880's onwards. Running cattle on these lands was incompatible with Aboriginal hunting and gathering practices and people were forced to settle on stations or the reserve. Many men worked as stockmen, drovers, butchers and gardeners, while women carried out domestic work in the station houses. Payment was generally in rations only and conditions were generally very poor. Although people were dispersed and forced to settle on stations and at the reserve, they travelled extensively across Warumungu and neighbouring country, visiting family, taking up employment at different stations. Many older people recount today their travels in the 1930's-1960's. People walked, travelled in horse drawn buggies and later trucks and cars. During the Christmas holidays people moved to bush camps, where ceremonies continued to be conducted. The last settlement to be established on Warumungu country, Mangka Manta or Phillip Creek Mission began in 1945. It was run by the Aboriginal Inland Mission until 1952, when the Native Affairs Branch took control. 215 people were moved there in 1945, most of them Warlpiri, from the west. The 1950's was the era of Assimilation and at Phillip Creek children were housed in dormitories, sent to the Mission School and instructed to adopt European ways. Part Aboriginal children were forcibly removed from their families here and sent to Darwin and Adelaide. The Mission site was temporary for it lacked permanent water. An alternative site was found in 1954, over 100 km to the south of Tennant Creek, on Kaytetye and Alyawarre country. Phillip Creek was granted The new settlement was named Warrabri, a composite of 'Warrumungu' and 'Warlpiri', known today by its Kaytetye name Alekerenge. At Warrabri, there were people from a number of different language and country groups; Warumungu, Warlpiri, Kaytetye and Alyawarre. The move from Phillip Creek, which was compulsory, took place in 1956. Warrabri was intended to be a model Aboriginal settlement, where the new policy of Assimilation could be put into practice. "promoting and directing social change amongst the Australian aborigines in such a way that, whilst retaining connections with, and pride in, their ancestry they will become indistinguishable from other members of the Australian community in manner of life, standards of living, occupations and participation in community affairs." (Welfare Branch, Northern Territory Administration, Warrabri Aboriginal Reserve, September 1961, p. 6). At Warrabri there was a strong focus on education and training. There was a school and adult education centre. By this time, there were also small schools on stations, often housed in caravans, known as silver bullets. Many young people were sent to secondary schools in Alice Springs and Darwin. By the 1970's, nationwide Indigenous movements for rights to self determination and control of country were responded to with gradual political change from governments. The Assimilation policy was replaced by a policy of Self-Determination and Land Rights legislation was introduced. Warumungu and other Indigenous people returned to Tennant Creek to establish their community in changed political world. The history of the region is presented and celebrated in the Nyinkka Nyunyu Cultural Centre in Tennant Creek. The total population of Tennant Creek is approximately 6,300, 3,220 people are of Indigenous descent. Tennant Creek is a small, remote town, much like many other outback Australian towns. Its main street, a stretch of the Stuart Highway which links Adelaide and Darwin, is a parade of shops stretching about 3 kilometres through the town. Tennant Creek is a remote service centre for the Barkly region, providing a wide range of amenities. There is a small hospital, numerous government agencies, an airport, town library, show grounds, a public pool and a variety of accommodation for tourists and employees of government and other service provision organisations, who visit the town. 500 km north of Alice Springs and 600 south of Katherine, the two closest population centres, Tennant Creek is a stop off point for travellers. The town's mining history is promoted to tourists and the old Battery is set up as a mining museum. In 2003 the Nyinkka Nyunyu Cultural Centre was opened, a purpose built centre, planned and designed in close consultation with local Indigenous people. The centre houses exhibitions on local history from an Indigenous point of view, cultural displays and local artwork. There are a number of Indigenous organisations in the town, such as the local Aboriginal council and housing authority Julali-kari, the health centre Anyininginyi Congress, an office of the Central Land Council and the Barkly regional language centre, Papulu Apparr-kari. Most Indigenous people live in one of the 8 residential 'town camps', others live at 'street addresses', individual houses on residential streets in the town. The town camps are located on the edges of the town, generally large estates with up 20 houses situated at a distance from one another. There is a primary and high school in the town, attended by both Indigenous and non-Indigenous children. In the 1970's and 80's, secondary students tended to leave Tennant Creek and board at secondary schools for Indigenous students in Darwin and Alice Springs, but nowadays young people tend to remain in Tennant Creek. An attempt was made in the 1990's to establish an independant Indigenous primary school, but this was unsuccessful. Broadly speaking, the traditonal language of Wakaya country is to the north east and east of Tennant Creek, Alyawarre is to the east and south east, Kaytetye is to the South, and Warlpiri to the west. Today all of the languages mentioned above, with the exception of Wakaya and the addition of Warlmanpa, are spoken by older people in Tennant Creek. There are younger speakers of Warlpiri and Alyawarre, who have grown in or spent extensive periods in communities outside of Tennant Creek, where these languages continue to be vital and intergenerational transmission continues. Language shift from traditional Indigenous languages such as Warumungu and Warlmanpa to Aboriginal English (AE) and Creolised English (CE) varieties is advanced. Some children at Rockhampton Downs Station, a cattle station to the north of Tennant Creek, spoke Warumungu in the early 1980's, but intergeneration transmission of full proficiency ceased in most places before this time. Young and middle aged people have varying passive knowledge and may be partial speakers of a traditional language, allowing them to include traditional language phrases, lexemes and morphology in otherwise AE and CE discourse. Aboriginal English and Creolised English are used in everyday communication between younger people and older people speaking with younger people. They are also the languages of socialisation of children. Many children hear and to some extent are addressed in traditional languages from older kin. Members of an extended families often share a house, live close by on the same town camp or visit regularly. For many children, an elderly relation acts as primary care giver all or some of the time. The language of education is Standard Australian English and people are also exposed to other standard varieties of English through popular music, TV, videos and DVD's. There is no sustained history of language maintenance programs through the education system. Warumungu language classes ran in the primary school in the late 1980's and early 1990's and have intermittently and briefly since then. The Barkly regional language centre Papulu Apparr-kari currently runs an Indigenous language, culture and history program for High School students, both Indigenous and non-Indigenous. Papulu Apparr-kari also offers cultural awareness courses for non-Indigenous people working closely with Indigenous people and co-ordinates some language documentation projects. Welfare Branch, Northern Territory Administration. Unpublished report. Warrabri Aboriginal Reserve, 1961. IATSIS archive. Yakanarra Community is situated on a small excision on Gogo Station, and lies approximately 80 kilometres south of Fitzroy Crossing in the Kimberley region of WA. The Community was first established in 1989 and now has approximately 150 residents. Yakanarra has twenty-three (23) community houses, seven (7) staff houses, a store/office complex and a health centre which were constructed between 1993 and 2002. The independent school was established in July 1990 and currently caters for approximately 30 primary students and up to 20 junior secondary students, in five classes. The school also runs an itinerant students' class ('visiting school') for children visiting extended family in the community. In 2001, a small Adult Education Centre was established as an annexe of Karrayili Adult Education Centre, Fitzroy Crossing. Students here are predominantly completing the Certificate in General Education for Adults although there are some who are now completing diploma level studies with Notre Dame University, Broome. Yakanarra has a complex language ecology: the participants in the study have Walmajarri as their traditional language, Kimberley Kriol as their language of general use, and are exposed to standard English. People in Yakanarra are multi-lingual, and shift with varying degrees of facility between these three languages. Such language shift is largely determined by situational factors that include location, purpose, participants and language skills. The Aboriginal Child Language Acquisition (ACLA) project at Yakanarra commenced in 2003. Its central focus was a longitudinal study of some twelve children (aged between two and four) and the caregivers, relatives. friends and community members who make up their linguistic world. The project followed these children over three years and provided data for the overriding ACLA research questions about the nature of the children's language input, the effect of this on their language acquisition and their productive output, and the processes of language shift, maintenance and change which may be hypothesised to result from this multilingual environment. A particular focus of the Yakanarra research, however, was the role of questions in the interactions between the children and their interlocutors. Researchers in education and linguistics (Harris 1990, Eades 1993) have argued that the Aboriginal learning paradigm has little place for direct questions and in particular that the concept of 'false' or iterative questions, questions to which the enquirer already knows the answer, is unfamiliar to Aboriginal children. Much of this research is based on impressionistic language data; indeed, there is very little corpus-based or quantitative data on pre-school age indigenous children's language. The data collected at Yakanarra has been used to describe and analyse the nature of the questions asked of and by children and the responses that accompany such questions.